As a physics groupie in search of curious characters, I’m always pleased when I manage to catch up with a scientist whose research I’ve followed, or in some cases when I’m just in the right place at the right time (like when Zoe and I unexpectedly found ourselves in the presence of Stephen Hawking). Sometimes being around science greatness just can’t be planned. This is just what happened when Zoe and I attended the Pacific Coast Gravity Meeting (PCGM) in March 2007 at Caltech. The annual PCGM attracts researchers from all over the world to a different west coast institution each year to discuss the latest developments in the field of gravitational physics, most notably classical and quantum gravity, general relativistic astrophysics and cosmology, numerical relativity, quantum cosmology, gravitational wave, and experimental gravity. Since this is my primary field of interest, I anxiously awaited the meeting to hear all the latest and greatest directly from the researchers themselves. But what I didn’t realize beforehand was that the affair was to be held in Richard Feynman’s old classroom in 201 East Bridge on the Caltech campus. The rickety old place has seen better days, but it is so steeped in physics history that just being there was motivating. 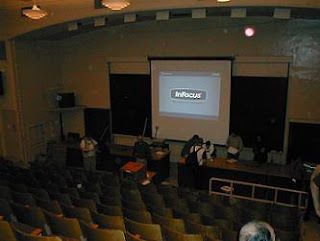 The classroom is the same one depicted in a number of classic pictures of Feynman teaching his now famous classes for The Feynman Lectures on Physics books. As I sat there soaking up the science, I felt the Feynman presence, the esteemed lore of the place, and the significance of what took place in that room.